So it’s Valentine’s Day on Monday. And knowing me, of course I’m not celebrating it romantically (hah), but only culinarily. In the “Valentine’s Day” chapter of Feast, there are three sweet treat recipes – Love Buns, a Chocolate Raspberry Heart cake and Custard Cream Hearts. 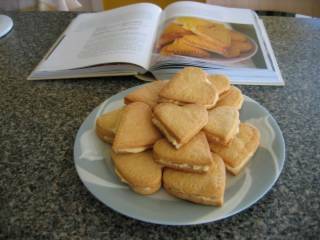 Given that I don’t think I need any more chocolate right this minute, and that I’m saving the Love Buns for a gay dinner party, I decided to make the Custard Cream Hearts. Custard Creams are more British than Australian, so I suppose that if they were more popular in Australia I’d probably get the full Wildean experience upon baking these… maybe if I tried making Tim Tams or Mint Slices I’d get the right idea. Anyhow, they’re just plain butter biscuits, made with the addition of custard powder, and sandwiched together with a custard-powdered buttercream. They’re crumbly, “frangible” and very very yummy! (With no bicarby fuzzy tongue taste… heh heh heh…) They're the first things I've made with my new Nigella Lawson's Living Kitchen cookie cutters. And despite some negative feedback from other forum-members, I found the heart cutter a breeze to use! The recipe makes 14 biscuits (i.e. 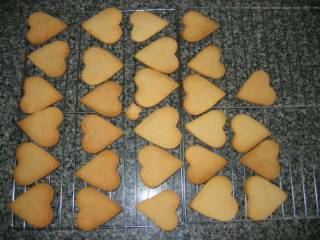 28 single hearts sandwiched together), which is entirely appropriate for Valentine’s Day. HOWEVER, seeing as there are four in my family and two whole days to go… they might not last until then!